The type of food that each of us class as comfort food no doubt varies wildly between all of us, but I’m willing to bet there are a few classics that come up time and time again. Any form of fruit pie or crumble smothered in custard must pop up on millions of Brits comfort food wish list, as must cheese on toast and roast dinner. For me, comfort food needs to be carb packed, whether that’s a shepherds pie topped with fluffy mash, a crunchy baguette smothered with butter, or pasta sheets layered up in a lasagna. Or it must be sweet, but again there needs to be an element of stodge from pastry, sponge or crumble. Eton Mess is delicious, no doubt, but when I’ve had a shocker of a day the last thing I need is a light fruity dessert. I need something heavy that will then leave me feeling so full and tired that the only thing left to do is drift off to sleep and wake up in the morning to a more promising day. Nothing cures a bad day more effectively than comfort food induced sleep. Being heavily pregnant and with The Boyfriend on a far away continent for another 11 days, comfort food has played a big part in recent weeks. Combine this with not having to concern myself with fitting into my normal wardrobe of skinny Topshop jeans and beloved tea dresses, and you’ve got one sure fire way to cheer me up. I’m lucky to have supportive family and lovely friends too of course to keep me busy and spend quality time with, whilst the great thing about pregnancy is that you find yourself no longer tolerating flaky or terminally ill friendships. If you ask someone if you’ve done something to offend them and they say no, then they continue to make thinly veiled comments on social media, create awkward atmospheres and ignore invitations, then I really can’t be bothered. I have to pee every 20 minutes and spend most of my free time either eating for two or being in bed by 8:30, I really don’t have the time, energy or the will to work out what’s going on. After my antenatal class yesterday, believe me there are bigger things to worry about! It was after this antenatal class that I knew I was in need of something comforting. There’s nothing like a midwife doing a demonstration with a doll and a plastic pelvic skeleton to have you running for the nearest bowl of carbohydrates. Especially when the midwife’s exclaiming how ‘isn’t nature wonderful’ and all you can think is that no actually, nature is not all that right now. I’m down with nature when it involves penguins or sunsets or daffodils, but there are some things that nature really messed up. Thanks nature. Luckily I have just the cook to turn to for a carby comfort meal – Miss Lawson of course. Her Nigellissima book is my least used of all of her books, I don’t like being constrained by one country’s recipes in a cookbook, but the recipes do look tasty, what with them being Nigella-fied. I went for the alliteratively pleasing pasta, petit poits and pancetta risotto which promised all the comfort and starchiness of a risotto without the 30 minutes of constant, mind numbing stirring which can be useful at times but not when in need of quick comfort. 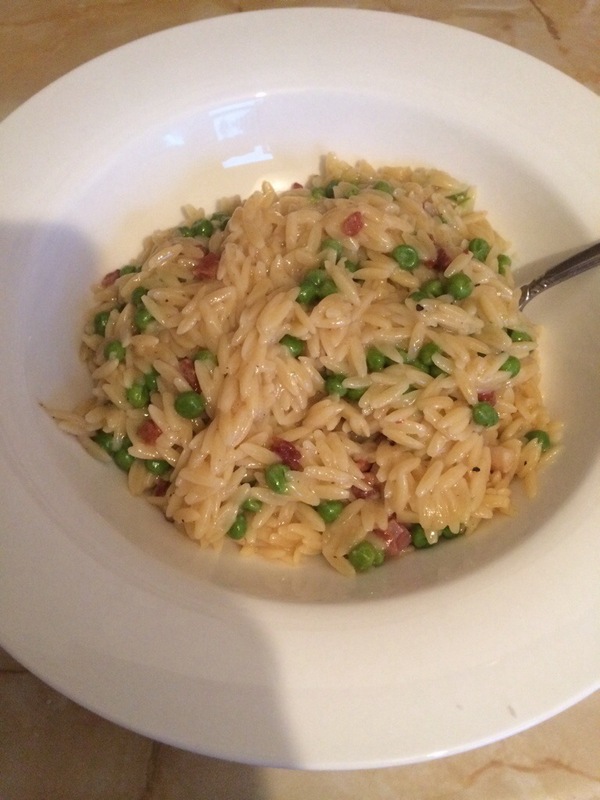 This is achieved by using orzo pasta which looks very similar to rice and absorbs the water quickly, leaving you with a dish not all that different to a rice risotto. It’s a very simple dish too, all you do is crisp up the pancetta in some hot oil, chuck in some frozen peas, pasta and water, then once all the water is absorbed stir in butter and Parmesan until melted and you’re good to go. It’s a one pan job too, there’s no chopping and most importantly no constant stirring, so for a mid week meal it’s simplicity itself. Taste wise, it’s not up there with Nigella’s greatest hits. Her recipes usually pack in a lot of flavour but this one misses the mark a little. It’s still comforting, the pasta is starchy and silky and there’s a faint tang of salt from the pancetta and Parmesan, but it’s just a bit too subtle. Nigella warns not to over salt the dish because of the already salty main ingredients, but it still wasn’t enough to bring out a lot of flavour. The flavour would probably be improved with the addition of a stock cube to the water, it might take the sodium levels up a bit higher but I’d imagine the taste would be much better. In fact, just adding a little more of all the salty ingredients would improve this dish, and perhaps half a glass of white wine. Maybe the short cut of using pasta instead of arborio rice means that the intensity of flavour that normally accompanies a risotto is sacrificed, because you’re not investing the time to gradually build up flavours. Still, if you’re in the market for a quick, easy, comforting dinner that takes next to no effort and would probably keep the kids happy, you could definitely do worse. Certainly not comforting enough though to get the image of that plastic pelvis out of my mind.